Dog chew toys serve a variety of purposes. In many instances, these products are used to help ensure optimum canine oral and dental health so that microorganisms can be effectively removed and help prevent the development of dental and oral health problems. In some cases, these are also beneficial for addressing the natural behavior of dogs to chew by giving them something a bit less destructive. For puppies however, chew toys can also serve to soothe sore gums especially during the teething process. With the 14 best chew toys for puppies in 2019, you’re now in the right position to care for your pups’ optimum dental and oral health. Designed specifically for the chewing behavior of dogs, the Nylabone Just for Puppies Starter Kit Bone Puppy Dog Chew Toys are one of the most sough-after products by pet owners perhaps because of its classic bone design. Unlike the KONG however, you cannot put any treat on the Nylabone since it does not have a chamber with which to hold your pup’s favorite treats. And as such, its use in training as a form of treat in positive reinforcement activities may be somewhat limited if not utterly useless. But this is not to say that the Nylabone Starter Kit Bone is any less effective in training puppies about non-destructive chewing. It still is. However, if there’s one thing that is truly an advantage for the Nylabone Starter Kit Bone compared to the Puppy KONG, that would be its inherent dental design. Once your pup starts chewing on the Nylabone Starter Kit Bone, the bristles will start to show, helping to brush the debris off your pup’s teeth and gums. This also helps remove any tartar or plaque that has built up over the course of a few months. This significantly improves oral health by eliminating disease-causing bacteria and other microorganisms that may lead to gingivitis or periodontal disease in your pooch. The prevention of periodontal diseases is very important as failure to do so can have a tremendous impact on your pooch’s overall health, particularly its cardiovascular system. The Nylabone Starter Kit Bone also comes in 3 different flavors so your pup is sure to have a heyday chewing down on these toys. The Nylabone Starter Kit Bone has a very unique mechanism for cleaning your puppy’s teeth, ensuring optimum oral health in the process. So, what’s the difference between the Nylabone Starter Kit Bone and the Nylabone Just for Puppies Ring Bone Puppy Dog Teething Chew Toy? The fact that the Nylabone Ring Bone is made of super safe, highly durable, yet chewable material, this simply means that you will never have to buy another puppy chew ever again. Nylabone Ring Bone doubles as a pull toy which can also help provide for an excellent play time for puppies. What are really remarkable, however, about this product are the ridges that form the surface of the Ring Bone. These apply pressure on the gums especially of teething pups. It thus, helps relieve the soreness that puppies get because of a slowly erupting tooth. Rather than giving them pain reliever or even an anti-inflammatory, the Nylabone Ring Bone provides a much safer solution to teething pains. And if all teeth have already erupted, the Ring Bone can serve its primary purpose of removing plaque and tartar off your pup’s teeth surfaces. At the very least, you’ll feel more confident that your pup will never have to suffer from periodontal or canine gum diseases and help prevent the development of more serious problems of the heart valves. The Nylabone Ring Bone is also excellent as a pull toy. 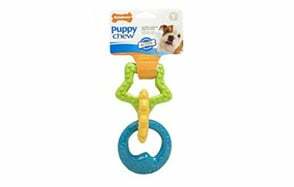 Rather than your pup pulling and chewing on things in your home that it is not supposed to chew and pull, your pup now has something non-destructive to both provide for hours of fun and satisfy your pup’s innate chewing and pulling behavior. 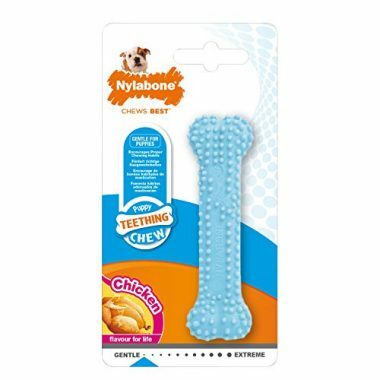 The Nylabone Ring Bone may not be as popular as the Puppy KONG or the Nylabone Starter Kit Bone but it sure is a more durable, longer lasting alternative to puppy chews. Love Nylabone but wish they had a different presentation? How about a puppy dog chew that’s shaped like a T Rex, then? 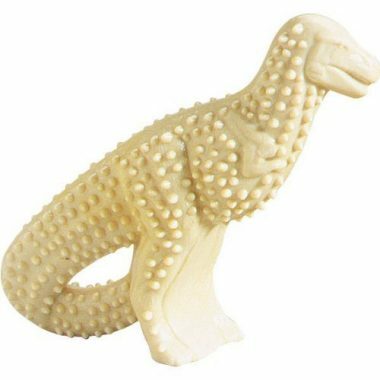 The Nylabone Dental Dinosaur Chew Toy provides a uniquely more fun way to address your pup’s destructive chewing habits. Flavored as chicken, your pup will simply adore chomping down on the Nylabone Dental Dinosaur, making it one of the most popular puppy chews that are designed to last a long time. The dinosaur design also helps stimulate the curiosity of your pup and may even stimulate the inner predatory instinct inside. This provides for a great toy which all pups will surely enjoy. The major advantage of the Nylabone Dental Dinosaur is the integration of what Nylabone calls massaging nubs all over the reptile’s body. These nubs or protrusions are what provide relief to sore gums during those times when your pup is shedding its deciduous teeth in exchange for more permanent ones. The nubs also serve as large bristles that can “sweep” bacteria and “scrape” tartar or plaque off their teeth. This helps ensure your pup will grow to have a healthier oral cavity, preventing the development of gum diseases that, in turn, can lead to other health problems. For a more fun and exciting way to address your pup’s destructive chewing behavior, teething concerns, and overall dental health concerns, the Nylabone Dental Dinosaur is a superb solution. Available in 3 different chew and pull toys, Petstages’ Mini Dental Chew Pack provides three different solutions to three different challenges faced by almost every other puppy today. These include the need for playtime and excellent dental health and addressing a pup’s growing chewing behavior. Made of a variety of surfaces from hard to soft, textured to smooth and knobby, the Petstages Mini Dental offers pet owners the ability to play fetch or even tug-of-war with their puppies but in a very safe and non-destructive way. At any rate, your puppy will not be pulling on your socks or even chewing down on the legs of your furniture because it will know that only the Petstages Mini Dental can provide it the much-needed mental and physical stimulation to become a happy and well-balanced pup. The materials used in the construction of the Petstages product guarantee durability and strength especially against the toughest and most aggressive chewers. Best of all, the ridges on the ropes help brush soft tartar or even plaque that may have already formed on your pup’s teeth. This establishes and maintains healthier dentition for juvenile dogs. More importantly, the hard surfaces on the Petstages Mini Dental can also help soothe the gums of teething pups so they will feel much more comfortable and will not pester you with their constant whining. 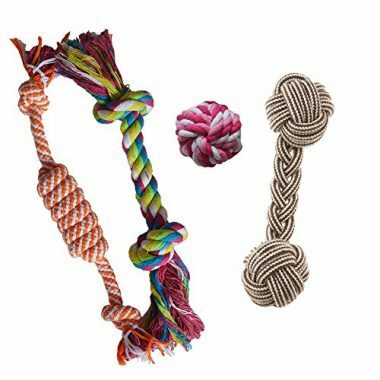 The colorful knots also provide visual appeal that may be of particular interest to your puppy. The Petstages Mini Dental combines soft and hard materials to provide your puppy the best solution for all of its playtime, dental health, and chewing needs. It’s colorful and it’s full of ridges that are perfect for your pup’s dental needs. That’s the best description we could ever come up for the MR. PLAY Dog Chew Toy puppy Teeth Cleaning Knotted Puppies Tug Toy. We know the name is quite long but let us just say that it’s a tug toy and a dental cleaning aid specifically designed for your puppy. The knotted ends of the MR. PLAY Teeth Cleaning Tug Toy provides the necessary anchor for the teeth of your pup as it tries to pull on one end and you pulling on the other. There’s going to be great fun tugging each other. It’s better than tugging on the leg of your pants or even your socks, don’t you think? And even if your puppy is not playing tug with you, it will never feel bored as the different textures on the puppy chew is sure to keep it entertained for hours on end. The beauty of the MR. PLAY Teeth Cleaning Tug Toy is in the middle section that is filled with ridges. Every time your pup tries to sink its teeth into this section, you can be sure that the ridges or knobs will be alleviating any pain felt by your puppy from teething. The smaller ridges, together with the multilayered fabric, can also help prevent the development of gum diseases. Your puppy will surely grow to become a much healthier dog with this around. The MR. 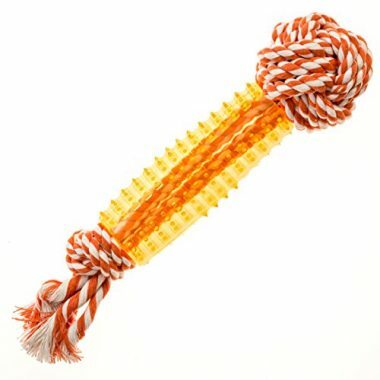 PLAY Teeth Cleaning Tug Toy has a simple yet very interesting design that is guaranteed to keep your puppy entertained. It’s also great for optimum dental health. 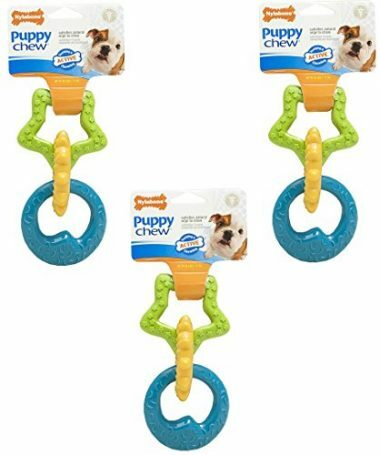 Designed like the Petstages Mini Dental Chew Pack, Activpet’s Puppy Chew teething Rope Toy Small Set Mini Dental Pack, however, is quite different in that there are no hard elements to its design. The Activpet Puppy Chew only has soft multilayered fabric that is designed to prevent tartar and plaque development. However, since the fabric materials on the Activpet are compressed tightly, these can serve to massage the gums of puppies that are undergoing teething. This helps provide for a more comfortable teething experience. The product is also designed for optimizing playtime with puppies as these are excellent toys for playing toss and fetch. Now, you get to ensure your puppy’s optimum dental and oral health while also giving it the opportunity to exercise and play. The Activpet Puppy Chew may not be as popular as the others in this list. Nonetheless, it provides a safe and effective alternative. If you’re looking for a really longer lasting puppy chew especially designed for aggressive chewers, then MR.PLAY’s Puppy Toys Dog Chew Bone is just what you need. It’s actually similar to MR. PLAY’s other product in this list except that it does not include knotted fabric. Instead, it’s made of indestructible material that’s guaranteed to last longer than the lifespan of your pet. Each of these toys is designed with ridges to help massage gums while also sweeping away food particles and other debris that can become a breeding ground for disease-causing bacteria. Since the product is made of indestructible material, you can rest assured that your puppy or small dog will have endless fun chewing on it. It’s thus, great for keeping your puppy or dog happy so that it grows to be a well-balanced dog. And we all know what this means, too. It simply means that you will have no problems caring for your pet as it will be responding to your commands in a very positive way. The MR. PLAY Puppy Toys Chew Bone is perfect for aggressive chewers. Its indestructible design helps guarantee durability. Featuring 6 different puppy chew toys in one package, the yotache Small Dog Toys Set comes off as a very practical solution to the inherent need of pet parents to provide their young dogs with the best kind of playthings to nurture their need to chew. At the same time, such toys can be highly beneficial when it comes to improving and strengthening the bond that exists between pet parent and his dog. The 6-item pack is just one of two yotache varieties, the other one having 10 toys per pack. 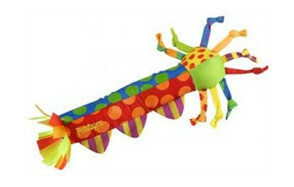 The 6-toy variant features everything from toy balls to rope and tug toys as well as squeakers. Many of these actually have certain features that can help improve your young dog’s oral health as well as address its teething concerns such as inflamed and painful gums. For its price, the yotache provides exceptional value especially since you’re already getting 6 different high-quality puppy toys in one pack. If you don’t mind giving your juvenile pet a neon green bone to chew on, then oneisall’s bone chew is perfect. Designed like the fattened femur of some hapless animal, the neon green oneisall chew is surprisingly durable as it’s made from heavy-duty nylon. It is this particular feature that gives the oneisall the ability to withstand the power of aggressive chewers. It is designed to be especially safe for your pet, too. However, when it comes to really removing tartar and plaque buildup, it may not be that efficient since there are no nubs that can serve as bristles. 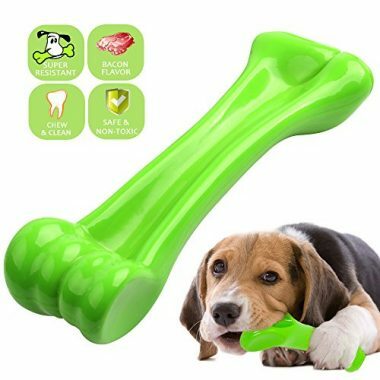 Nevertheless, your young pup should have no qualms about sinking its teeth into the nylon construction of this green bone. The bacon flavor and the durable nylon construction of the oneisall are strong points for the puppy chew. We only wish there were other colors, though. Nylabone’s Petite Puppy Chew Toy is perfect for teething pups as it comes with dental nubs or ridges that should help soothe inflamed and painful gums. The same ridges can also serve as a puppy toothbrush for removing food particles and other debris that can get trapped in between your young hound’s teeth and gums. It’s also available in chicken flavor, further enticing your puppy to chew to its heart’s content. It’s not designed for aggressive chewers, however, so caution should be observed when giving to your young canine friend. At the very least, you will be addressing your pet’s chewing tendencies and move it away from destructive chewing behaviors. Nylabone’s dental nubs make it the perfect tool for removing plaque and tartar that may already be beginning to buildup in your pet’s teeth. These nubs are also perfect for soothing gums. Pet parents who are tired of the same usual nylon, plastic, rubber, or polyester construction of their dog’s toys can perhaps find comfort in Hyper Pet’s Hyper Chewz. 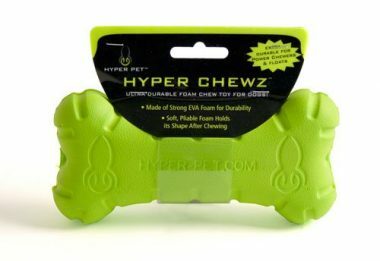 Made of high-density, extra-strong, and super-resilient EVA foam, the Hyper Chewz is perfect for mild to moderate chewers although the brand says that power chewers will not shred the Chewz to bits. It’s available in a variety of toy designs, though such as bone, tennis ball, bumpy ball, stick, and hubcap. Unfortunately, they only come in Incredible Hulk-green. 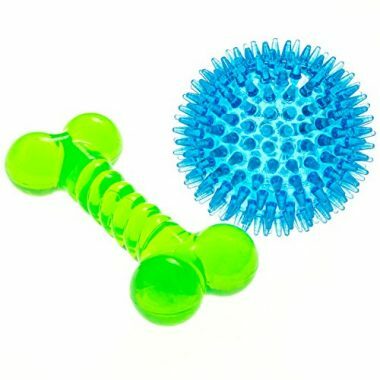 The good news is that they’re so lightweight that these toys can be excellent during the summer as you entice your young pet to play fetch both on land and in bodies of water. The EVA foam construction of the Hyper Chewz is something quite unusual for a chew toy. Its buoyant properties make it an exceptional water toy. 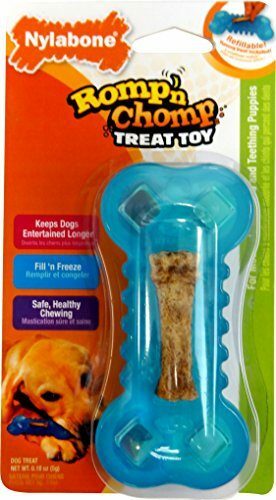 The Nylabone Romp ‘N Chomp Freezer Bone with Treat is a great alternative to other puppy chews as it comes with a neatly-designed central compartment for hiding your pup’s favorite treats. You can consider it as a treat dispenser, although not really in the same fashion as the KONG Classic. Nevertheless, the Romp ‘N Chomp can be placed inside your freezer to help cool it and help relieve gum inflammation as a result of teething concerns. This should help guarantee that your pet will be having endless hours having fun with this chew toy. Do take note that the Romp ‘N Chomp should never be given to power chewers as they can easily tear this down to smithereens. At least, you’ll get the same satisfaction pet parents always derive from the chew toys of Nylabone. The treat-refillable and freezable properties of the Romp ‘N Chomp clearly extends its overall usefulness especially in terms of providing instant relief for your puppy’s teething issues. The Puppy X Bone from Nylabone is a neat solution to a puppy’s sore gums. Imagine a bone that comes with an attachment right in the middle forming a cross with its surface covered in soft yet durable dental nubs. Every time your pet will be whining because of an aching tooth or swollen gums, a few minutes spent chewing on the Puppy X Bone should give your very young hound the kind of relief that it sorely needs. 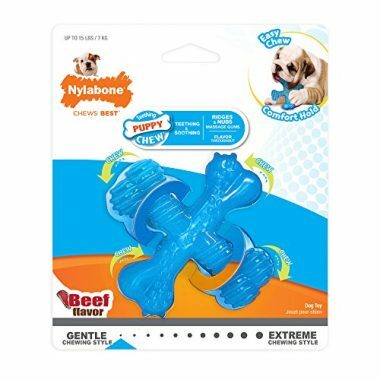 Getting your dog to chew on the X Bone is quite easy, too since Nylabone decided to infuse it with the richer flavors of beef, making it more enticing even to young pups. While its principal purpose is to help puppies find relief in their teething concerns, the Puppy X Bone is exceptional, too when it comes to fostering their sense of fulfillment related to their instinct to chew. The functional dental nub-embedded design of the X Bone is perfect for pups with teething concerns. The use of beef instead of chicken flavor is notable, too. 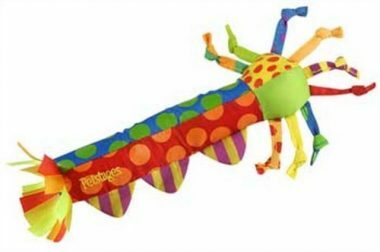 The Petstages Cool Teething Stick actually resembles the larvae of mosquitoes – elongated with a lot of segments and antenna. Or you can also look at it as an unusually large yet colorful crustacean sans its two large pincers. However you describe the Teething Stick, its main draw among pet parents is its freezability. Once frozen, you can easily give it to your pet. The cold temperature of the Teething Stick helps numb sore gums while giving your pet the chance to live out its instinctual chewing behavior. Mind you the Teething Stick is not really intended for power chewers as the material used in its construction is not really that sturdy or durable to withstand the force of a really mean chewer. It’s like putting ice cubes on your puppy’s gums once the Teething Stick has frozen. The colorful design makes for fun playtime, too. Just like any other guide, it was crucial to obtain a more concrete understanding of what the best chew toys for puppies are for. This is to help us better choose the right products to share with you. First, the functionality of the item was determined. This was very important since there are those that are designed to be used as a plaything only while there are also those that cater to the chewing habits or behaviors of doggies. It was imperative for us to look at a variety of features that were built into the product to make sure these provide a host of benefits as well. Customer experiences with these products were also considered. While we did see a few products that have 5-star ratings, the number of reviewers for that particular item somehow limited the veracity of its usefulness. Items that have a substantially greater number of reviewers and users coupled with a sufficiently high consumer product rating are almost always guaranteed a place in our listing. For items that may have questionable ratings, we delved into the reasons why they think the product didn’t deserve a higher rating. These reviews are quite subjective, so we wanted to know if there was really a basis for the negative comments. The safety of the product was also determined. While dogs aren’t humans, they are also vulnerable to chemical imbalances, infections, and other health problems. It is important that the products do not leach chemicals that may be harmful to our furry four-legged mutts. Part of the safety profile of the product was the overall trustworthiness of the company that made it. Reputable companies can always be relied on to deliver, not only high-quality products but also safe ones. Just as oral health is important for excellent health in humans, dogs too, require a healthy oral cavity and teeth so they will be adequately protected from a variety of systemic diseases associated with a canine periodontal disease. Like us, dogs, too require meticulous oral and dental health care to help prevent health problems. Unfortunately, they don’t have hands to brush and floss their teeth. But there are some ways we can do to help keep dogs’ teeth healthy and clean. Here’s how. Use a dedicated doggie toothpaste. As much as possible, don’t use human toothpaste to brush and clean your pup’s or dog’s teeth as these contain ingredients that are considered harmful to dogs. Canine toothpaste are specially formulated so that dogs don’t need to rinse anymore. If a canine toothpaste is not available, you can manually clean your dog’s teeth by wrapping a piece of moistened gauze around your finger, dab it in baking soda, and gently rub against your dog’s teeth. Always give your dog good food as the correct nutrients will help guarantee healthier teeth structure and healthier gums, too. If you have to give your dog fruits and vegetables, choose those that don’t contain starch and too much sugar as these can hasten the development of plaque and tartar. Offer dried meats as these are considered excellent chew treats. The chewing action will help keep your dog’s teeth sparkling clean. You can also give chew toys. As we have already presented in this review, there are a variety of chew toys you can choose from. Consider giving your dog raw bones especially the larger ones. Don’t give chicken bones or any other small bone as these can break or produce splinters which can injure your dog. Chew toys can provide a host of benefits especially among growing and rapidly-developing puppies. Aside from the fact that chewing is already an innate behavior in many pets including dogs and cats, chewing can also bring about various effects. Here are some of the more important benefits of using chew toys especially on puppies. The process of teething among puppies is not really that different from the teething period of human babies. It’s painful as the growing tooth widens its anchor within the gums of the puppy. While there may be no pain, inflammation is always a constant. Dental chew toys that come with especially-designed nubs or protrusions can help alleviate the pain and reduce the inflammation experienced by puppies that are going through the process of teething. The protrusions exert pressure on the gums, sending pressure signals to the puppy’s brain so that it is the pressure that is registered and not the pain. Pressure is more tolerable than the sensation of pain. Food particles that get stuck in between teeth or between gums and teeth can lay the framework for the formation of biofilm. These food particles can be the source of energy for bacteria to grow and multiply. Once they’ve grown in number, they start producing a thin film which will protect them from the slightly acidic environment of the dog’s mouth. Over time, plaque and tartar will develop leading to tooth decay and gum disease. Dental chew toys can help prevent these from occurring by serving as your dog’s fun and entertaining toothbrush. These chew toys can help remove food particles and other debris while also preventing the colonization of the puppy’s mouth by bacteria and other germs. Chewing is as instinctual as barking. Without the ability to chew, dogs and other pets will simply not be able to process their food. This can lead to a host of nutritional deficiencies. Unfortunately, puppies have not yet learned some of the ‘rules’ of nondestructive chewing. For them, they can literally chew on anything as part of their nature. While you can slowly train your growing puppy not to chew on certain things or objects, you can provide them with chew toys as a more positive and more rewarding chewable target than a furniture, bedding, carpet, upholstery, or any other item in your house. With training, they will learn that chewing on their chew toys is good while chewing on other objects is not good. Puppy chews are also known to keep your young dog mentally stimulated so that it will not feel bored. While there are dogs that are perfectly fine with just lying around all day long, they will still need some form of activities to keep them busy. This is especially true for puppies that have to be left at home when pet parents leave for work. Since puppies and dogs depend on the interaction they can get from their human masters, the latter’s absence means there is no interaction at all. This can lead to canine boredom, frustration, and anxiety. At least, if your puppy is chewing on a chew toy it will not feel bored as its mind will be exceptionally busy chewing the toy. If you choose the right kind of chew toy for your pet, you may actually provide it endless entertainment. While there is no such thing as an indestructible chew toy for a really tenacious, determined, and powerful chewer, you can at least provide your pet with a toy that will last a lot longer than its usual set of toys. This is where the careful and thoughtful selection of the right chew toy to give to your puppy and dog can help. Picking a chew toy for your puppy can be hit-or-miss especially if you don’t consider the following things in your buying decision. Puppies are defined as any young dog that is below 12 months of age. However, it is very important to understand what specific stage of this 12-month period your dog is currently in. This has something to do with the size of its mouth. Younger puppies will have smaller mouths requiring smaller chew toys. Older puppies will have larger mouths requiring appropriately-sized chew toys. You also need to consider the breed of your pup. Puppies of large and giant breeds may already look like the full-grown adult size of a small dog breed. While they may still be 3 months old, their mouth size can already surpass that of a small breed. As such, you should also pick a puppy chew toy that is appropriate for your pet’s breed. Nothing lasts especially if you have a tenacious power chewer at hand. Remember, too, that teething puppies tend to have more aggressive chewing behaviors because of the pain and inflammation that is occurring in their oral cavities. If you have a young power chewer at home, then it is a must that you get a chew toy made of durable materials like nylon or even rubber. You want something tough so that your puppy will have some pressure with which to work against. However, it is also important to look for a chew toy that is soft enough for your young pup to chew on it more like prey. It is very crucial to choose a puppy chew toy that is neither too soft nor too tough that your pup loses interest in it altogether. Getting your puppy to like its chew toy can be tricky especially if you don’t do something about its flavor. As such, picking a chew toy that comes in a flavor that puppies are guaranteed to love is one way to help them like their chews. The durability or strength of a chew toy is an important consideration especially if you have a power chewer in your pack. This helps prevent breaking the chew toy into tiny pieces that can cause a variety of digestive problems for your juvenile hound. It is very easy to say that you should pick this kind of chew toy for your teething puppy. However, sometimes it also helps to know the things that you really should avoid when picking a toy for your teething puppy. This is self-explanatory. You don’t want your dog to be chewing and licking on something that is essentially leaching out chemicals such as BPA and other toxic substances. Read the label carefully and do your research. Like we’ve said, there really is no such thing as an indestructible dog chew; uncles you’re going to give them something metallic. The point is to never give your puppy something that can be easily torn apart or one that is composed of many small pieces. These are choking hazards. Sure you may think you’ve saved a lot by getting 10 toys for the price of one. But if the quality simply isn’t there, then you’re only exposing your young puppy to many potential dangers. Besides, stuffed toys are super soft that they don’t really do much to alleviate the problems of your teething puppy. It is quite obvious why you should never give your puppy a chew toy that looks like any of your household items. If your puppy cannot find its chew toy it will be chewing on this household item since it looks essentially the same. We already mentioned above that the size of the toy is a very important consideration. Too small and you risk choking your pet to death. It may not die instantly, but the small toy can get lodged inside your pup’s gut, requiring expensive surgery. Q: How do I keep my puppy interested in chew toys? A: There are many ways in which you can keep your puppy, or any dog for that matter, interested in its chew toys. First, you will need to have several toys, to begin with. Make sure to give your pet one toy at a time or once every couple of days. Once you’re ready to bring out another toy, you can safely hide the previous one. By the time your pup has been exposed to all of its toys, bringing out the first chew toy will look like brand new to your young dog. Putting the chew toys in the freezer can also help especially if you have a teething puppy. The frozen toy serves as a cold compress which can numb painful and sore gums that typically develop during the teething process. Alternatively, a frozen toy can also double as a means to cool itself down during summer. 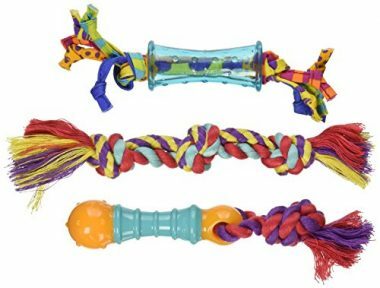 Chew toys that are designed as a puzzle or interactive toy will always keep your pet entertained and interested in its playthings. There are chew toys that double as treat-dispensers which can provide a sense of accomplishment for your pet as it is able to retrieve the reward using its own skills. Q: Are all the best chew toys for puppies safe? A: Unfortunately, not all chew toys are safe for puppies. As we have already mentioned above you should be careful about chews that are easily broken into bits as these can be choking hazards or cause digestive problems including intestinal blockage. There are also chew toys that are laced with dangerous chemicals like BPA and phthalates, just to name a couple. It was never easy picking the best puppy chew toy since almost every other product had its remarkable pros and quite insignificant cons, although there are those that really stand out. One of these is the Nylabone Puppy Chew Toy and Treat Starter Kit. Starting with the brand, there really is no questioning Nylabone’s philosophy when it comes to providing pets with the best possible chews. The brand has been producing an array of dog chews and chew toys for many years and have created a brand image that is already synonymous to high quality. 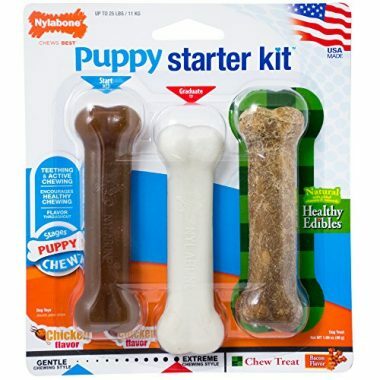 But what really set their Puppy Chew Toy and Treat Starter Kit apart was that it came with three different kinds of puppy chews in chicken and bacon flavors. The way in which the chews were constructed also guaranteed that they are going to last exceptionally long while improving the health of your puppy’s teeth and gums. The massaging action of the chew is also beneficial in soothing sore gums, a phenomenon that is very typical in teething puppies. It is for this reason that we are one with many pet parents in saying that the Nylabone Starter Kit deserves to be on top when it comes to puppy chew toys. Caring for our dog’s teeth is crucial to ensuring their optimum health. Helping them act out their innate chewing instincts also help to create a more well-balanced puppy and dog. With the 14 best chew toys for puppies, you can ensure these and more.